Yemen – one of the poorest, but the most interesting countries in the Middle East, as virtually all are steeped in thousands of years of history. People live in the ancient mud skyscrapers, their houses side by side with ancient ruins and mosques. The capital is one of the oldest cities in the world, which is still full of life. One of the main attractions of Sanaa – gate Bab el-Yemen, built seven centuries ago. No less interesting is the tourists and the central market of the capital. 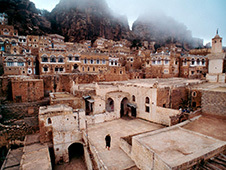 The surrounding area is Sanaa Al Munakab valley and mountain city, resembles a fortress. The most famous settlement in the area is considered to Shibam – a kind of open-air museum. Rock is located north of the capital Dar al-Hajar, a long time served as a place of residence of the Imam. Nature lovers should visit the Yemen Socotra Archipelago. In this unique nature reserve there are a variety of endemic flora and fauna, and the locals speak a particular language, and fire by friction. Seeing as many interesting places during the trip will allow car rental in Yemen. You can rent a car at the airport in the center of Sanaa or Aden, book your favorite model of car – on bookingcar.ru. on the road - 80 km / h.
As the designated parking spaces in the small towns, the majority of Yemeni drivers put the car in the far right lane (sometimes even 2 rows). Natural cluster of machines there are various vacant lots, wide streets, squares. Specially organized free parking is near the hotels, restaurants, government agencies, large stores. Paid parking in Yemen almost there. In big cities there are one-way road. Movement in the country right hand. You can not park on the sidewalk. Required documents for foreign drivers is to allow, resulting in traffic management Sanaa. Those who take a car rental in Yemen, be aware that the local oil is of low quality and meets only two kinds. Most filling stations offering petrol AI-80. It is more difficult with 92 octane fuel - it will have to search. The average price of AI-80 - 65 YER, AI-92 - 130 YER.